Sometimes circumstances lead one to try new methods that that would have otherwise waited for years or never be tried. I am one of the last people to actually still use paint for lettering and illustration on signs. Traditionally, signs have been lettered with oil based paints. These days the quality of some colors has been questionable. This has led me to experiment with urethane paint, Dupont Imron specifically. This type of paint is typically used on boats, semi trucks, and industrial applications. Acrylic enamel is a type of automotive finish, also more durable than oil based paints, but the results of my experiments using it as a replacement for brush applications have shown it to be very impractical. So it was with surprise that I have continually been very pleased at the attempts to use Imron urethane as a substitute for brushed lettering and art projects. Another incident was when I needed to paint some aluminum panels black for lettering the next day. I had a covered outdoor area to do this job, but due to high winds and rain, I had to do it on the upper floor of a nearby building. Using spray equipment there wasn't an option, so I decided to try and roll on the urethane paint. Years prior to this, I had tried to roll on an acrylic enamel, but it formed strings between the roller and pan, just like melted cheese on hot pizza. The dry finish of the urethane was mirror like. I was again surprised. An additional circumstance was the enactment of new laws early in 2011 regarding the use of spray equipment. One of the jobs that came my way was the painting and lettering of a railcar. This client is familiar with Imron and requested that it be used on the railcar. Imron has unusual drying properties, and I was reluctant to put masking tape and paper over a freshly painted area of Imrom. The roof of the car is black, the sides a pullman green. I thought that if I painted the body green, then rolled the roof black; I wouldn't need to mask the green. I first tried rolling a smaller area at the bottom of the car, these doors cover an accessory piece of equipment, I think it's a generator or air conditioning unit. Again, the test results were very good. Next is the back door frame trimmed in black with a brush. At this point I started wondering about painting the entire car with a roller. I tried it, did the whole job that way, but it was a big learning process, not an easy one. This article is to share as many of the methods, setbacks and results as I can remember. The fumes will knock you over. You can read elsewhere about the toxicity of urethane and ISOCYANIDE fumes; and the safety equipment required. Even though the finish is being rolled instead of atomized, the fumes are inescapable. What I want to say in this regard is that if your forced air breathing mask was like mine, that is, set up to feed the mask and T'd off to also feed a spray gun; then lighten it up. It only needs to feed the mask, you need it light as possible because you'll be going up and down ladders A LOT. 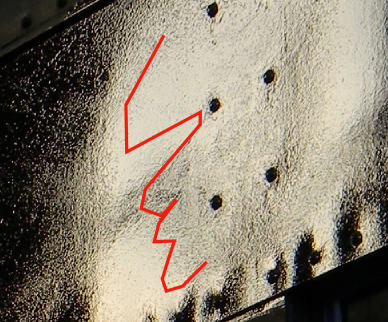 This job was a very difficult one to initiate a method on, because of its many large rivets. These are like battleship rivets. They really did not want this car coming apart easily. Conversely, it was a great place to try a new method, because if it can work here, it can work most anywhere. The advantage to this old car was that the body is made with plates of metal that overlap. So one only needs to make it to a seam before freshening the tools, mixing another two part batch of paint, taking a break, whatever. If it were a continuous body surface, any attempt to restart the painting would show. The Wooster brand roller was awesome. They make different labels, all references are to this brand and type of roller the type in the accompanying pictures. My initial thought was that the nap on the roller should be shorter, like 5/16 inch, so that when it hit a rivet, less paint would be pushed out, with less chance of a run. What I learned was opposite of my first assumptions, a deep nap roller is actually much better. In order for a short nap roller to get paint around the base of the rivet, the painter must slam the roller into the rivet harder, which -does- cause a run. A deep nap roller gently reaches down into that corner and puts the paint there. Not foolproof mind you; an overloaded deep nap roller can put down too much paint everywhere. As for other methods, here too I made some wrong assumptions. You -must- use the rolling thinner available for Imron. It's not used in anywhere near the quantity of a reducer, it would be much more appropriate to call it an additive. When you first roll on the paint, it makes thousands of little bubbles in the paint. When I coat out an aluminum sign panel with oil based paint, as soon as the surface is coated, I empty the short nap foam roller back into the pan, or on another panel. Then with the wet but empty roller, I roll it back over the surface. The empty roller pops the many bubbles, and absorbs the excess paint from those bubbles. The finish is really nice. If you've never seen it, you'll be surprised. The foam rollers cannot be used for this paint, because they will last about 22 seconds when used with strong solvent paints, 30 on the outside. The solvent causes the foam to unglue from the cardboard core. First it goes flap-flap, the comes apart completely. So foam rollers are not an option for this type of paint. Besides, I need a deeper nap. If you wait about half an hour, most of the bubbles in the Imron pop by themselves, and the finish lays down to a nice glossy appearance. A bit nerve wracking at first. Where I made the second wrong assumption was in thinking that since the paint layed down like this, it would also blend into itself if I joined two wet areas together after a short time delay. The edges of the panels have a trim or other piece of metal overlapping them, so there's always a corner around the edge. It requires a brush to cut that place in. I would cut in a long section of edge with the brush, say about 4 or 5 feet. Then I came along with the roller and filled in the middle of the panel, ending just the other side of a double row of rivets. Then I would go on ahead with the brush, followed by the roller. My assumption was that since the paint did a great job of laying down these two wet areas would blend together. Bad assumption. Upon drying, the edge of the previously applied area showed through very well. All the way down the side of this 72 foot long car. I had to sand it all down and start over. This when I was already behind schedule, and the car needed to leave the shop. The two pictures below show where the first application, made with slanted strokes, didn't blend with the coat applied shortly afterward. So I learned to cut in shorter sections with the brush, about 2 feet at the most. Another important thing to remember is to mix the paint in small batches, less than a quart. Seriously. Maybe as small as a pint, if the weather is hot. You need to develop a fast way to measure and mix. What happens with a larger catalized batch is that the paint gets thicker, and the bubbles don't pop. Also, do not try to push an inadequate amount of paint to the edge of a stopping place. A dryer application dries faster, which doesn't allow the bubbles to pop. When I was doing this paint job, it was probably an average of 70 or 75 degrees Farenheight. I think that 90 degrees or higher would certainly limit the batch size to 1 pint, that temperature might make this roller method impossible altogether. 1 pint goes far enough to make this workable, but again, get fast at mixing these batches. While we're on the topic of mixing, here's a neat trick: have some strips of rag or paper towels on the mixing bench. These can be about 1.5 inches wide, and however long. The idea is to wipe the threads of the hardener can everytime you use it. That way, it will always open easily. You use a little rag strip for this, then throw it away. If you use a full size rag, you'll be throwing it away for a very small job. If you don't throw it away, you'll be grabbing it next time you're at the bench, and get the stuff on your hands. It is poison. A portable bench with nicely rolling wheels is a big plus. You're constantly switching between tools and mixing batches of paint, this method is not for comfort seekers. Sometimes it is possible to work the brush and roller out of the same pan. Always lay the brush along the side of the pan, and be sure to not have the roller get paint where you keep the brush, or the handle will have wet paint on it. One nice thing about spray painting is that when you're painting near the underside of the car where dirt is, the spray will lay on top of the dirt, and not move it around. Rollers and brushes -will- move dirt around. This requires some mental readjustment. You have to move from the clean areas to the dirty ones, do them last. If you have the brush in the pan with the roller, draw the paint into the brush from the same corner everytime, that way the brush won't be bringing dirt where the roller will pick it up. Here are a couple of brush techniques: When one first learns hand lettering, you learn the importance of “palleting” the brush. Before making a brush stroke, or before every other stroke, you dip the brush into the paint, then work it back and forth on a clean surface. Back in the day, that might have been a Sears catalog. The reason is to get fresh paint between the hairs. Oil based paint congeals fast enough to hinder the free flow of paint out of the brush. Before computer made lettering, sign writers had to be very productive at knocking out nice looking letters with a single stroke (not one stroke for each edge). One of the pleasant surprises with the Imron is how well it keeps flowing from a brush. Still, it helps to know how to keep a brush flowing better. The other brush technique is for faster brush painting. Let's say that you're using a 3 inch wide brush to paint a piece of metal that's 6 inches wide by 5 feet long. This wouldn't take me long at all. If you've seen TV commercials where Der Craftsmahn is dreamily lifting a wet brush out of a paint can, then slowly wiping the brush against the rim of the can to remove most of the paint; as though he was a world class chef serving pie to the Queen, well forget it! Get the brush as absolutely loaded as possible, I mean major amounts of paint inside the brush and running off. Hold the paint can or container over the piece to be painted, so that you don't drip it all over the floor. Mentally take aim where you're going with this thing, then lifting the brush out of the container, not wiping any off, make a fast hopping motion with the brush on the surface. Don't jam the hairs straight down like you're trying to break them. It's more like the way a parachutist lands, that down and sideways impact. You do this hopping motion like blip-blip-blip-blip until the paint isn't dripping off the brush anymore. You immediately stroke the brush back and forth through these deposits you made on the surface. This spreads a large amount of paint quickly with...a brush, of all things. Just to clarify, I used a 1.5 inch natuarl hair brush on the rail car project. The above speed method is just to expand your abilities with a brush. More info: In the past, I've had to paint a repaired section on one of these rail cars. It had a new piece of steel welded onto/into the body panel. These cars have been painted a number of times, with various methods, and various paints. So it is that they have an even texture to the previous paint, what painters call “orange peel”. I matched the texture by spraying on some very thick primer, the result was great. This time, I needed to do the same thing, but I wanted to do all the work without spray equipment, so I attempted to use the same primer with a small roller. I carefully tried to pull the primer out onto the existing paint. It dried with a bit of a course grit, along with the desired texture, so I lightly sanded it. This whole attempt at matching the texture was a disaster. You can see the result here. Because time constraints were bearing in inescapably, I had to forgo the texture matching. What's strange is that it didn't seem to matter. Don't quote me on this, but it seems as though, when using Imron in a roller, smooth areas will gain texture, but textured areas won't gain more texture or fill in the existing texture. Since I was seriously over the deadline for this railcar, I had to finish the lettering on site, not at the repair shop. That site happens to be the Knoxville Riverfront. For your viewing pleasure, Ive included a picture looking up at the demolition of the Henley Street Bridge.